I am just now getting the chance to blog about my new treasure, because life gets in the way (as all you bloggers know!). I returned to the trees yesterday to find the fruit was mostly done for; there were only a couple left. I am writing anyway, hoping that if anyone out there finds a tree still producing fruit, you'll be able to forage a small harvest and experience the wonder. Or, if you saw one of these trees and wondered about it as the fruit dropped, unheeded, you can take a note for next year and plan to return. I will be returning to forage these fruits each year from now on! In fact, I am so enamored by them, I have been scouting the yard to see if there is any chance we could grow them ourselves (even though Cornelian Cherries are self-pollinating, 2 or more trees planted together are best for maximum fruit production). 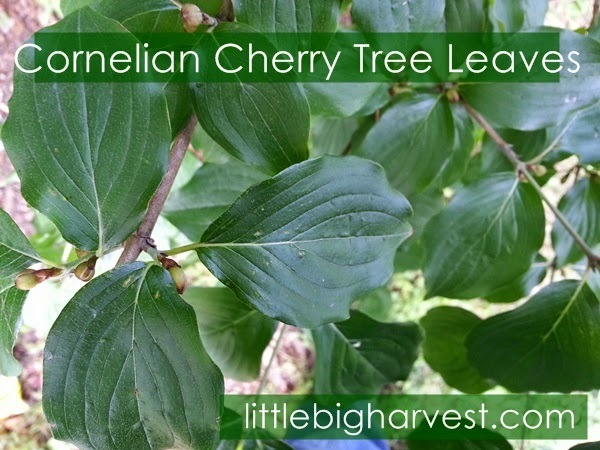 So, what is a Cornelian Cherry? First of all, Cornelian Cherry is not a true cherry at all. It is a type of dogwood (scientific name Cornus Mas), originating in the Black Sea region (Turkey). I give credit to Janet from One Acre Farm for coming to my rescue in identifying the tree; at first my trusty google was no help. It wasn't until I finally gave in and asked for some help on FB that I found out what I had foraged. Thanks, Janet! The Cornelian Cherry was historically used as a popular food source. With time these beautiful trees spread throughout Europe and the UK, and they were eventually introduced to North America, where we can find them today. Cornel-berries, which we use instead of olives ...should be picked while they are still hard and not very ripe; they must not, however, be too unripe. They should then be dried for a day in the shade; then vinegar and must boiled down to half or one-third of its original volume should be mixed and poured, but it will be necessary to add some salt, so that no worms or other form of animal life can be engendered in them, but the better method of preservation is when two parts of must boiled down to half its original volume are mixed with one part of vinegar. This one is actually very popular in Thrace region of Turkey and they even have an expression related its juice : "spitting blood but telling people they drink "kizilcik" juice". It is used for women who put up with the hardest times of their families and to praise such action instead of seeking help from outside, telling around their troubles. Most people in North America do not realize the fruits from this tree are edible. The trees are usually planted in public parks as part of the decorative landscape. I have not seen the trees in the spring, but apparently they are one of the earliest to bloom each year, with a breathtaking display of dainty flowers. As one of the earliest spring bloomers, they are also one of the earliest sources of nectar for hungry bees. That fact alone makes me love this tree! I can't wait to visit the trees next spring to see the beauty of their blossoms. What can you do with Cornelian Cherries? First of all, when they are super-ripe, they taste incredible straight from the tree. My mouth is watering just thinking about it. When they are not super-ripe, they don't taste as delectable; one source I read compared the flavor of newly ripe cornel berries to a mix of cranberry, plum, and sour cherry. To me, unless they are super-ripe, they are almost unbearably sour. My middle son takes issue with that statement. He ate a couple handfuls of barely-ripe cornel berries in front of everyone, claiming he loved them (and to his credit his favorite candy is sour patch kids)--but I have to wonder if he just liked our incredulous facial expressions as he ate them and spit out the pits. My own cornel berry marmalade--indescribable flavor! Jam and Cold Cherry Soup--using a secret ingredient! Where did I find this treasure? At a local park! One that we've played at several times a year, for at least 15 years. We made our discovery in two separate visits. Each visit was an entirely different experience. After the first collection of fruit, I wasn't convinced that they were much of a treasure. But as you'll see, when we returned a couple weeks later, we were met with something entirely different; I fell head over heels in love. The tree was beautifully overgrown and filled with bright red, very sour fruit. The trees had been severely trimmed in our absence, but there was plenty of fruit left. had been turned into a taste like nothing I'd had before! I can't quite describe the sensory heaven that this fruit brings to me. They have that distinct sweet/sour bite that I love from true sour cherries, but with an added floral scent. I would put it in the same category as quince; a floral, fruity, mysterious taste. A flavor that relies almost as much on your sense of smell as it does your tastebuds. 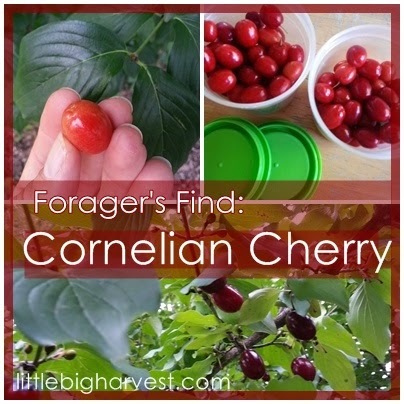 I hope you get a chance to find some cornel berries in your neck of the woods. Read on for a little more detail on our discovery, from my personal journal! We've been coming to this park for many years, usually a half dozen visits per season. While it's not the closest park to our home, out of the dozens of parks we are lucky to have in our city, this is one of our favorites. Somehow in all the times we've come here, I'd never noticed this fruit-bearing tree. Maybe we just never came during the fruit-bearing window of time, or, more likely, I briefly noticed and only gave it half-second of consideration, thinking 'nuisance'. After all, the little fruits are all over the ground, getting stomped on, smashed, played with by park-going kids as they make pretend stews with it on the sidewalk. I always used to wonder why park planners would plant messy trees in areas that they knew children would be playing. With my eyes now more finely tuned to foraging opportunities, I saw the fruit as if for the first time today. The tree was loaded with bunches of olive-shaped... berries? Plums? Crabapples? We cut one open with a woodchip and saw a single pit inside. The flesh smelled plum-like to me. I assumed that even if park planners are goofy to plant messy trees by kids' play areas, they would not be likely to plant anything harmful. So, guessing that I was seeing some kind of little wild plums, I started plucking them to put in my bag. I didn't have to say a single word to the kids--before long I had helpers. Kids adore picking things, you know! I surreptitiously picked, feeling strangely guilty, as if some park ranger or city official would appear out of the thin air to scold me or fine me. Or some passersby would watch me and wonder if I was desperate or insane, picking fruits off a decorative tree. The kids alternated between picking and climbing under the tree. When I peeked under to see, I realized there were three separate trees, growing together at the top, forming a glorious little fort underneath its canopy. (Later I read that these trees do best planted in twos or more, to aid with pollination.) We had a wonderful fifteen minutes enjoying the mystery tree before we packed up and went home, my bag having been emptied of its books and papers and now lumpy at the bottom with a nice haul of mystery berry-fruits. At home, I googled 'little plums', 'plum varieties', 'wild plums'...any combination of 'plum' I could think of. I asked for help from online friends on my Facebook page. Finally, my friend Janet from One Acre Farm had the answer; Cornelian Cherry, a type of dogwood. As soon as I entered the name on google and come up with images, I knew this was exactly what we had. Feeling safe that what we had picked was edible, I tasted one. So sour! Almost unbearably sour. My sour-loving son, Simon, ate at least a dozen that night, carefully eating around the pit and spitting it out, while everyone else in the family either had a tiny bite and said NO THANK YOU, or refused to try them at all. I tucked all the berries away into the refrigerator until I could figure out what I'd do with them. 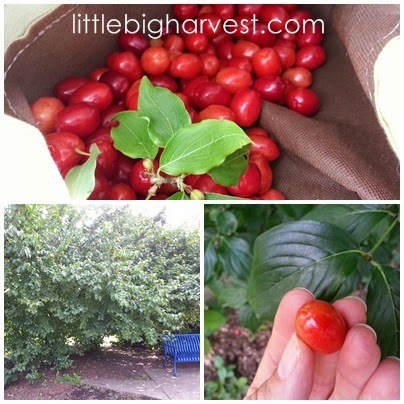 A couple of weeks passed, school started, and as we acclimated to the dramatic shift in schedules that comes with the new school year, I often thought of the Cornelian cherries. I had still not done a thing with the sour fruits in the fridge, but they had not gone bad. I was collecting recipes and researching. I often thought about the fascinating trees, and intended to get back to collect more of the berries. Finally we were able to return to the park, and as I parked the van and peered ahead at the trees, I immediately felt a little bit of dread. 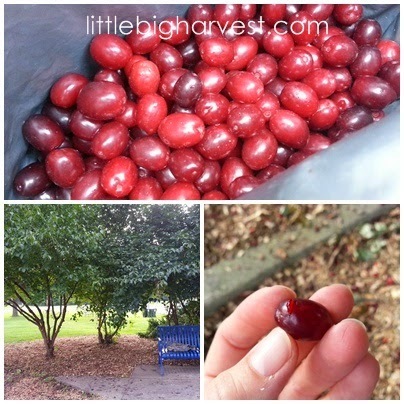 I couldn't immediately see any bright red fruits, and the trees looked drastically different from what I remembered. What was it...why did they look so strange? As we walked closer to the playground, it was obvious what had changed; the trees were half gone! Some overzealous parks landscaper had chopped off the bottoms of all three trees. Not all was lost; as we got closer, I could see red fruits all over the tops of the trees. More noticlable, though, as we neared, was the scent. Oh my goodness...the scent was almost overpowering. These cornel berries were so ripe and luscious, just absolutely dripping from the trees, their fragrance bursting out. I picked up a couple of the fruits from the ground that hadn't been smashed; the skin was so delicate on the very ripe fruit that a hole popped from my gentle touch, and juice dripped out. I decided to sample one of these ridiculously ripe fruits. Remembering the face-scrunching sour flavor from the barely-ripe berries, I braced myself. Once I had the super-ripe cornel berry on my tongue, it almost seemed to melt. It was sweet, it was smooth, and it was delicious! I could eat handfuls of these cornel berries, being careful of those pesky pits (which actually just seemed to melt away now that the berries were ripe). 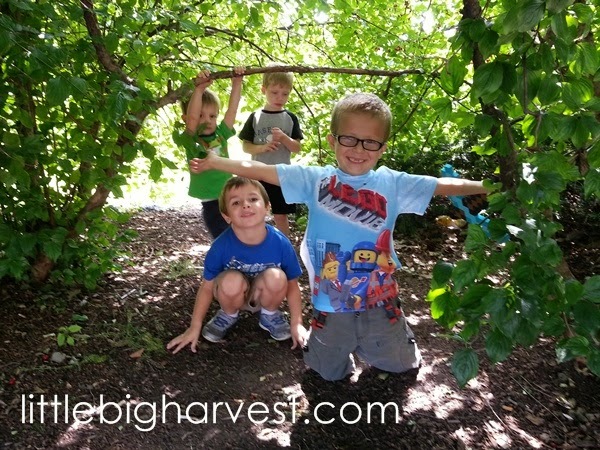 I collected a nice amount of berries as the kids played, and made a mess out of the bottoms of my shoes and jeans. 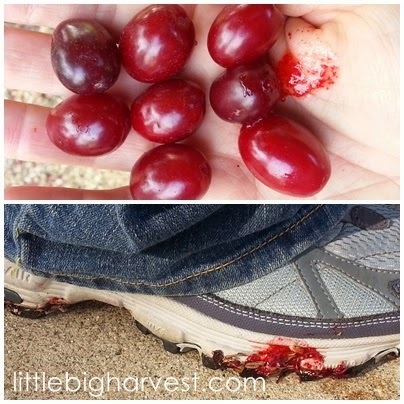 There were berries all over the ground, squished; there was no avoiding getting some of the carnage on myself. While it was all very worth the mess and effort, as I worked and reached for the high branches, berries just dripping like rain around me--even landing right down inside my shirt at times--I quietly brainstormed next year's harvest. A dark colored tarp, laid under the trees, and a gentle shake to the trunk would deliver more than enough perfect berries without as much mess. Eating these berries plain, and coming up with ways to prepare them, is going to be such a fun adventure. I'll be coming back here to forage every late summer from now on. Thanks for Reading, And Happy Foraging! Hi Andrea! Great post, and thanks for mentioning me!! 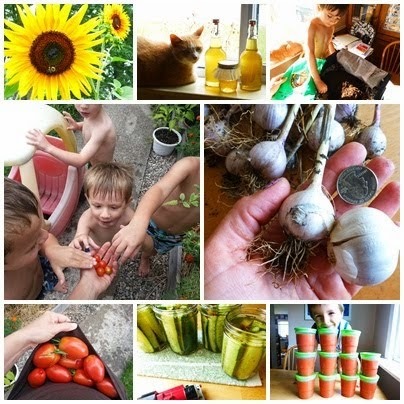 I just tried to invite you to pin to my Foraging for Edible Wild Plants pinterest group board, but could not find you on pinterest. If you do have an account and want to pin to that board, just say the word. By the way, I love the look of your blog. Very attractive and orginal! Thank you so much for reading, Janet! I do have a pinterest account, but I've had trouble figuring it out. I would LOVE to join as soon as I can make sense out of it. ;) Oh my, thanks for complimenting the blog. Not very fancy but it's like my little home base. I appreciate the kind words! I like your blog post too! You have discovered my obsession. I've been doing a lot of research with this plant. The fruit is just the beginning. Once the pulp is off the pits I roast & grind them. Makes a good coffee substitute. Also the dried leaves make a great tea. I hope you visit your spot often and have fun with this wonderful plant! Oh my goodness, John, thanks for your comment! I had no idea there could be uses for the pits and the leaves! My new obsession is only going to grow by leaps and bounds. ;) I hope to visit the site I discovered for years to come...I hope no one ever cuts the trees down or I'll have to find room to plant my own. Learned about this tree and its fruit and recipes on my canning site on face book ordered one to plant in my yard . Thanks for the info. Joyce, it's such a beautiful tree. I hope you enjoy yours! Thank you for stopping by!